As we met on 3rd June in the car park at 8.00am, it was 12 deg and a little dull but it soon brightened and became quite warm. Just right for a walk for anyone! As usual, in the car park area we found a variety of birds. If we had decided to linger there – always a temptation as it is bird-rich – we would surely have found even more species but a walk around most of the Trust area is our main intention for birding and a moderate walk; this is why we like to meet up there once a month. The car park had a hovering Kestrel, a male, but no prey was at hand while we were there. But there is always a chance of viewing one pouncing on a vole – part of the natural food chain, but perhaps something not liked to be seen by everyone. The Trust has put up a nest box on Little Trees Hill specifically for Kestrels, but as yet they seem to breed elsewhere but they regularly use the Downs as a place to find food. In the car park, we also had a chattering Magpie, and singing Wren, Garden Warbler and Robin. We could clearly hear a Skylark just over the hedge over the North Down, close to the main path up the hill. 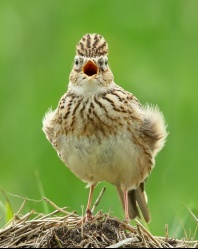 To us this showed that Skylarks and dogs on walks can live together, but only if the dogs are kept apart from the ground–nesting birds in the critical periods. Altogether, we had at least two singing Skylarks on the North Down and also there a lot a corvids of various species, mainly Rooks. In our usual route through the Magog Wood and towards Villedomer Wood, we noted the usual birds but also two Mistle Thrushes, now more regular, which may show them to be breeding on the Trust but we are not sure. We were pleased to find Yellowhammers, Linnets, a loudly-singing Goldfinch, and especially a singing Corn Bunting along the Stapleford-side outer perimeter path. Strangely no Whitethroats were confirmed. Butterflies may not always be identified reliably but Meadow Brown and Speckled Wood were indeed seen, showing that some members of the club have expertise well beyond birds. The gallery below shows a random six of the birds that have been seen on Magog Down.